As much as I like touch devices, there's something about an actual button that can't be replicated. A game designed completely around a touch interface is great, but emulating a traditional controller on a touch device leads to mixed results. 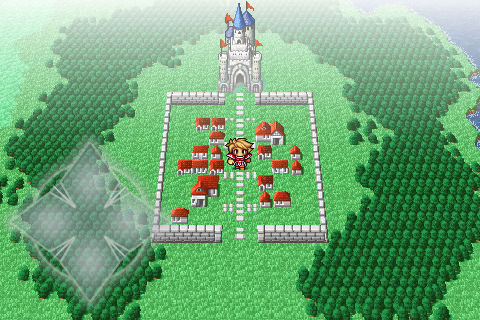 Final Fantasy I uses a virtual d-pad that is definitely a hindrance to the game. The d-pad is often unresponsive or laggy in interpreting inputs. It's not game-breaking, but it's an annoyance for sure. Attempting to push a direction multiple times before it actually acknowledges my touch gets frustrating. It's a shame that the d-pad falls short because the rest of the controls in the game, from battle actions to the menus, have all been modified to work seamlessly on a touch device. I wish that Square-Enix could have found a better way to do character movement, but I can't really think of one. It's just one of the pitfalls of porting a game from a system that was controller based. Going forward it will be interesting to see how developers choose to tackle similar problems. Just look at games like Angry Birds and Fruit Ninja. They have no traditional buttons, but they're two of the most highly regarded games on the platform. But generally, on a touch device, the more touch oriented you can make a game the better it will turn out.